Combinations of flavors can make a memorable stellar sandwich. I had one recently that sparked me making these the other day. 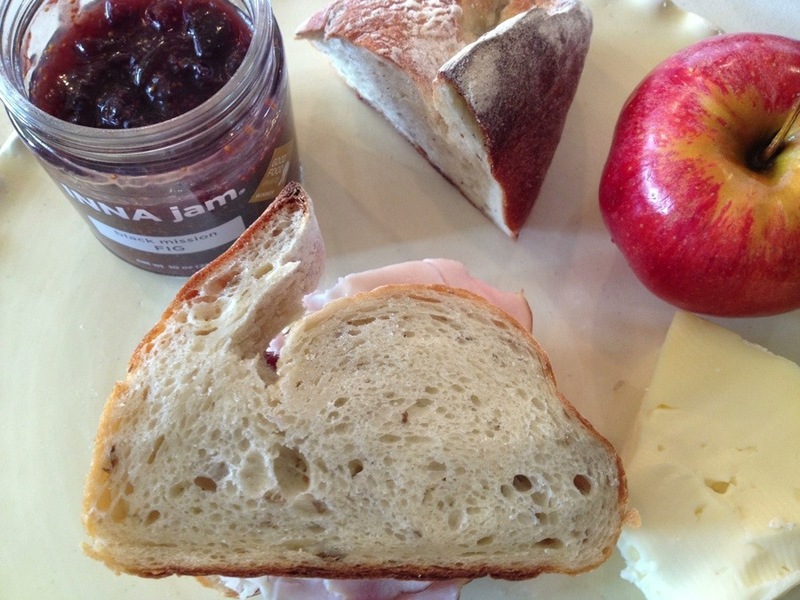 They are our Wine & Dine Wednesday pick of the week–Brie, ham and fig jam. The pungent soft cheese mixing with the salty ham with the tart, yet sweet fig jam is really quite something. I initially had it on a croissant, which added a flaky, buttery goodness. I was not finding any to my liking at the grocery store the other day so opted for rolls that were made in the bakery on the premises. Rolls of this sort always take me back to my childhood visits to my grandparents in Wisconsin, where rolls were served at almost every meal. A crusty baguette would be divine, as would a seeded bread. You are only limited by your imagination. We stock this most extraordinary black mission fig jam by INNA jam that is out of this world that I am always looking for ways to incorporate into meals. Though any good quality fig jam would do. Just be generous in your spreading of it, as you want the flavor in each bite. I did the top and the bottom of the roll so both the ham and the cheese were in contact with the fig jam. The Brie, make sure you leave it out for a bit first, so it gets a tad soft and runny, making it easier to spread. Plus, that is when the complexity of the cheese really comes through. The Black Forest ham looked best at the grocery store, so I opted for that. Choose any ham to your liking. Then prepare to be transported for a short while as you enjoy one heck of a tasty concoction. We had our Watson Kennedy Holiday staff party Sunday eve at Beecher’s Loft. More on the loft in a later post, but oh what fun we had! Ages ago we bought a full set of alphabet letter cookie cutters. 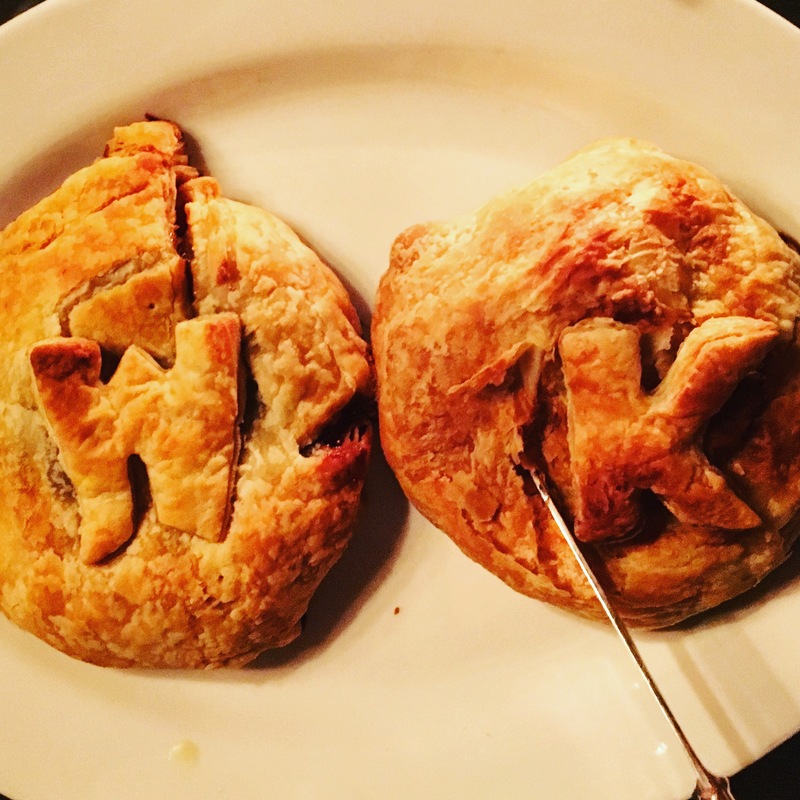 Out they came to fish out a W and a K, which I thought would be a whimsical twist instead of a plain topped baked Brie. 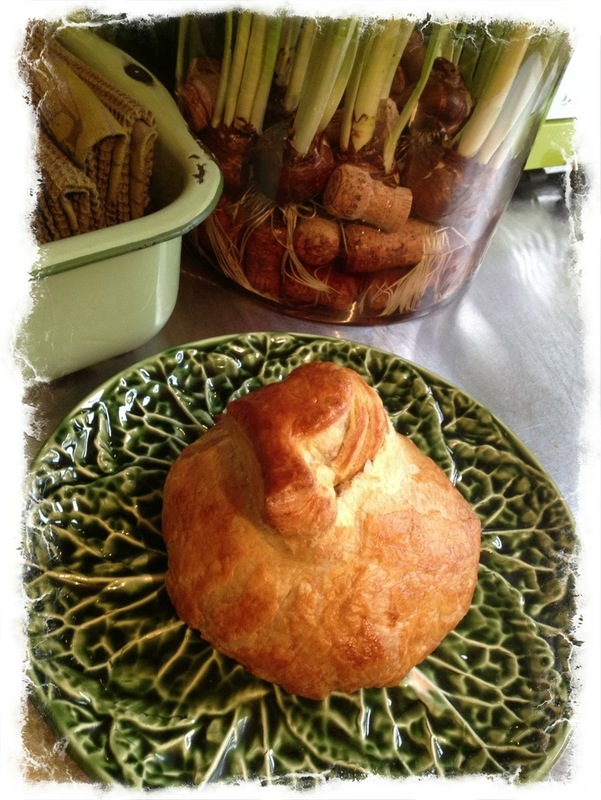 Several years ago I wrote a post on baking a Brie with puff pastry dough. I will post it below, but instead of using cherries, for these two I did fig jam in one and apricot & ginger chutney in another. What bumps up the flavor quotient considerably is adding more dried fruit to the mixture. I cut up a bunch more dried figs and added that. To the chutney version I cut up a bunch of candied ginger and added that. Baked Brie is always a crowd pleaser, as it is so hearty on a cold night served with cocktails before a later dinner. Here is that old post: This time of year I am always looking for quick options for things to make to serve at gatherings at home or bring to a party. Baking a whole small Brie in pastry dough is one of my go-to options during the Holidays. Last year I added fig jam. This year I am really loving adding cherry jam, as well as a handful of dried cherries. The combo is a great sweet/tart with the warm Brie and pastry. Turn oven to 350 degrees to pre-heat while you assemble this. You will want to use one of the two pastry sheets that come in most puff pastry packages. I like the Pepperidge Farm brand, which is what I typically find at our grocer. Any brand is fine. Follow the instructions on the box for thawing. The sheets are folded into thirds. Unfold and cut one third off, and set aside. Using a full small Brie, cover the entire top of the cheese round in cherry jam. Add to that dried cherries. Moving carefully & quickly, flip it over onto the waiting pastry sheet, so the jammed top is now on the bottom. Take the pastry and fold all of the sides up and over the Brie, encasing the entire concoction. Now flip that entire thing over onto a baking sheet. If it is parchment lined, all the better. Now with that remaining third of a sheet of dough, press out a few decorative images with a cookie cutter or if you are really creative, just use a sharp knife and make something fun. Add those to the top. Almost there. Now take an egg and crack it into a bowl and add a splash of water to make an egg wash. Beat together. Brush the egg mixture over the entire top and sides of the pastry, as this will really help it to brown. Bake for 20 to 30 minutes, or until puffy and golden brown. Let sit for a bit before serving, so the cheese is not too hot. It really is best warm, but room temp is fine too. This began with a good sized piece of Brie left over from having guests last Sunday to dinner. I had read somewhere of Brie with apples on a sandwich so it got my mind thinking in that direction. A hearty sandwich rates pretty high in my book, so next came turkey as I thought it would work well with the two. The Black Mission fig jam by INNA jam would seal the deal and add another flavor element. Jam and cheese go so well together. Off came the rind on the Brie as I was just wanting the creamy texture and then took the skin off the apple and made large thin slices. Lastly, the bread needed to be not overly rustic, so the potato bread from Macrina would be perfect as it has a softness to it. The combination of it all made for a many layered hearty lunch where not much else was needed. This time of year I am always looking for quick options for things to make to serve at gatherings at home or bring to a party. Baking a whole small Brie in pastry dough is one of my go-to options during the Holidays. Last year I added fig jam. This year I am really loving adding cherry jam, as well as a handful of dried cherries. The combo is a great sweet/tart with the warm Brie and pastry. I made the above for our friend Peg the other day as part of her birthday present–hence the ‘P’ on top. Swap out whatever cookie cutter image you like. Stars and leaves are my seasonal favorites.